Authorities of the Kwame Nkrumah University of Science and Technology (KNUST), have converted all traditional halls of the school into mixed halls. The halls include the all-female hall, Africa Hall. 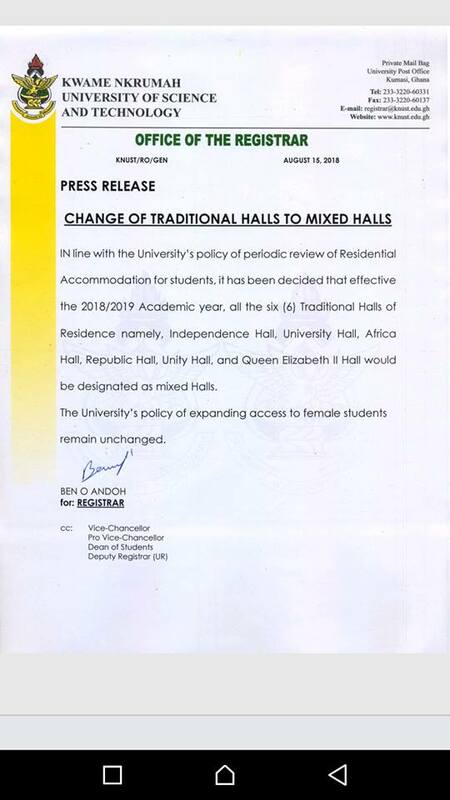 This means that, with effect from the 2018/19 academic year, all six halls of residence of the University have been converted into mixed halls. The decision comes at a time when the alumni and residents of the University and Unity Halls are battling with the University over the conversion of the all-male halls into mixed halls. “In line with the University’s policy of periodic review of Residential Accommodation for students, it has been decided that effective the 2018/2019 Academic year, all the six (6) Traditional Halls of Residence namely, Independence Hall, University Hall, Africa Hall, Republic Hall, Unity Hall and Queen Elizabeth II Hall would be designated as mixed Halls. The University’s policy of expanding access to female students remain unchanged” the statement added. The conversion of the University and Continental Halls in particular, has been met with stiff opposition by both present and past students. Kwame Yeboah, Public Relations Officer of KNUST, said the decision would go a long way to reduce the number of female students in the school without accommodation. Alumni of the University hall, Katanga, staged a demonstration over against the conversion. The demonstration started from the Kwame Nkrumah circle and ended at the Education Ministry where they presented a petition to the Ministry of Education. The authorities say the University cannot pretend to be solving the problem by changing boys’ halls into mixed halls. They asked the University to immediately consider other alternatives including the construction of new hostels to accommodate female students.